This is one of the most common questions that comes up with prospective clients on a weekly basis. Often times they will call me or rush into my office and the first thing that comes out of their mouth is, “This should be dismissed, the officer did not tell me my rights!” This is a dangerous game to play as the client is attempting to have their case completely adjudicated within a matter of minutes with no discovery being reviewed, no interaction with the prosecutor, and without ever going before a Judge in regards to the matter! 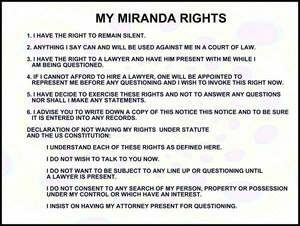 I always slow my client down and tell them, with few exceptions, that not being advised of their Miranda Rights is not the “Get out of Jail” free card like they may think. In the 1960s the Supreme Court held that Miranda Warnings by the police are required to protect a person suspected of a crime pursuant to their Fifth Amendment right to avoid self-incrimination during police interrogation (“I plead the 5th!” is the phrase that has become part of common vernacular). However, when the police have other damaging evidence that is independent of a person’s statements, any potential Miranda issue may be moot. Therefore, even if a person’s statements are suppressed (inadmissible), the State may still proceed against them based on that other independent evidence and witnesses. Swerving of vehicle, slurred speech, PBT results, failure of field sobriety tests, and bloodshot eyes all make the person’s statement irrelevant even if suppressed. Visual evidence of a person driving the vehicle and the fact that the license was in fact suspended makes the person’s statement irrelevant if suppressed. The fact that the person had possession (actual or constructive) with no legal right to do so is completely independent of any statement that may be suppressed. Please be advised, if a great amount or ALL of the substantial evidence is derived from the person’s statement then that evidence (and case) could be dismissed under the “Fruit of the Poisonous Tree Doctrine.” Fruit of the poisonous tree is a legal metaphor and exclusionary rule used to describe evidence that is obtained illegally. The logic of the terminology is that if the source of the evidence or evidence itself (the “tree”) is tainted, then anything gained from it (the “fruit”) is tainted as well. When substantial evidence is suppressed the case may be dismissed. Please remember that entire books have been written on 5th Amendment issues. This blog is only intended to give real life examples of how it is implemented. 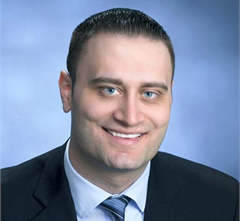 Please feel free to contact me with any questions or concerns about any legal issues.